CRAPPIE Lake Scugog is a very popular ice fishing destination. The most commonly caught fish through the ice are black crappie. Scugog boasts a very healthy population of slab crappie and these tasty fish keep the anglers coming back as well as provide great sportfishing opportunities with ultralight icefishing rods. Crappie in excess of 1 lb are caught annually although most fish average 0.5 lbs. Crappie between 10-14" make excellent table fare and if you're fishing the right spot it isn't difficult to catch a limit in an outing. Most anglers use pinhead minnows and small tube jigs to entice these sometimes finicky fish into biting. Best colours of micro-tubes seems to be white, yellow and chartreuse. If the bite is slow, scale down your presentation by using tiny tear drop jigs tipped with a waxworm or maggot. This can be deadly when nothing else seems to be working. The best locations to target Lake Scugog winter crappie are weed edges with healthy green weeds. 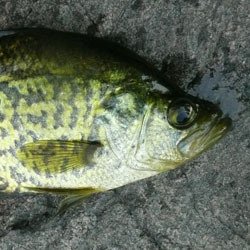 Although the Scugog crappie bite can be sporadic, crappie seem to be most active at dusk and dawn. 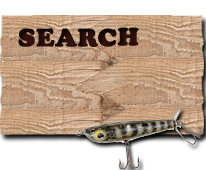 WALLEYE Effective Jan 1, 2016 Walleye fishing on Lake Scugog is closed. The most sought after fish on Lake Scugog during the ice fishing season is the walleye. Although very plentiful at one time, the walleye fishing has slowed in recent years. The factors that have caused the walleye decline are unknown, although the increase numbers of crappie in the lake which have been known to eat walleye fry may be the primary cause, as well as fishing pressure. Even though Lake Scugog walleye numbers seem to be on the decline, many anglers are still successful. Fish in excess of 6 lbs are caught annually, although the average Lake Scugog walleye is 1-3 lbs. Fishing at dusk seems to be the most productive time. Jig and minnow or buckshot spoons are the primary choice of presentation. PERCH Lake Scugog is a virtual perch factory. Any random hole you drill in the lake and drop a line, you will start catching perch. Unfortunately the majority of the perch in the lake are stunted and average 4-6 inches. 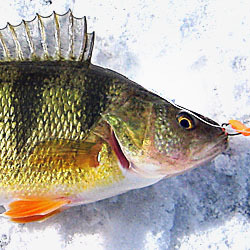 Although jumbo perch can be found in some areas, and annually perch in excess of 12 inches (1 lb) are caught. These Lake Scugog jumbo perch seem to inhabit very shallow areas with green weeds and often sight fishing is the ticket to land these lunkers. Baits of choice are pinhead minnows, small tube jigs and small spoons or tear drop jigs. Again waxworms and maggots can be deadly some days. Lake Scugog is a very popular lake during the ice fishing season and on any given day hundreds of ice huts will dot the landscape in the productive areas. Small shanty towns are consistently located in well known areas year after year and fishing these areas, will generally guarantee you catch some fish. Although searching out areas away from the crowds can produce one of those banner days, we all dream about. Each detailed map provides depth, contours, structure, boat ramps, and updated fishing information. Ice Fishing Lake Scugog fishing maps also include lake info such as gamefish abundance, forage base, water clarity, weedline depth, bottom composition, complete latitude/longitude grid lines and dozens of GPS waypoints & coordinates.